Excellent Tenerife Titsa Public bus News of May 2018 for the green vehicles locally called Guaguas. Buy a card called Tenmás for Euro 2, just once. It works like a credit card but isn't available at banks. Get the Tenmás card at the shop called Prepay at the Tenerife South Airport, at bus and Tranvia depots and offices as well as at petrol service stations where you can also stock up on its credit. 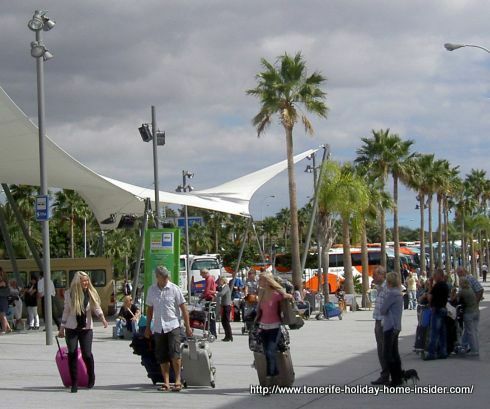 Titsa green bus stop spot at Tenerife South airport unchanged is good news, while so much else has changed. Also, you can still pay cash to the driver. The old bus stop with the green Titsa column , as seen above behind the pedestrians has never been moved which is good to know. It still is almost facing the airport arrival lounge. Get any other information related to Tenerife buses and bus fares, there. The Shell Station of Toscal Longuera a Punto de Recarga (charge point) was out of stock when I passed there on May 20, 2018. Now, it totally stopped selling TenMás card.s It was selling like El Gordo sells before Christmas, as the Bonobus card wasn't for sale any more but could still be used. Not any more since September 03, while it may be exchanged until October 31, 2018. Latest news say you can even swap old Bonobus cards but not more than 4. Also they must have been bought after January 2017. What has changed with Titsa since the Tenmas card? Computerization is part of it. Drivers lose less time. Bus arrivals at stops with billboards have become almost totally reliable. The fact that drivers avoid being late at stops makes them more stressed and it's best to ask questions at terminals only. In fact, be wide awake at some of them and wave at them, as soon as you see them. They seem to want to race through, as almost happened to me at Las Arenas in Puerto de la Cruz. I was told that the Tenmas card doesn't expire, as long as it has credit on it. They said in August 2018 that the Bonobus was going to be valid for one year after you bought it. I still saw people with it in August 2018 and the machine for it was still working in all buses. This is history now, as learned in September. 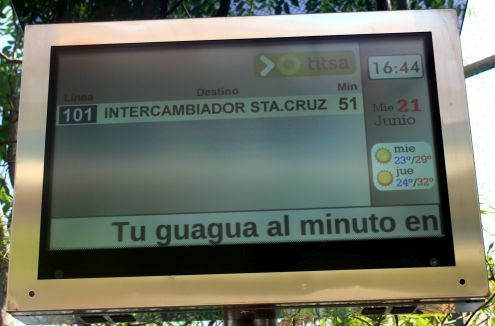 It was published by the door of a Titsa bus in Puerto de la Cruz but now all machines inside buses are also crossed out and are marked accordingly. 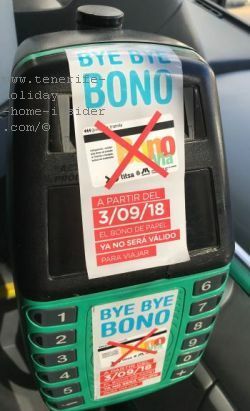 It is suggested that you change your Bonobus for a Tenmas card at any Titsa or Tranvia office or Station. Titsa bus the Guagua at Avda.Canaria of Realejos Tenerife. You pay cash to the driver for a paper ticket while not more than Euro 10 may be changed. Download the Titsa app in the i-phone appstore and the Google android one in Google Playstore and register with via-movi.es. Two way billets alias round tickets or in Spanish Ida y vuelta where you pronounce the letter "a" like in the English word America let you save about 10% provided the journey is 21 km or more, such as from Puerto de la Cruz to Icod de los Vinos. The Euro 47/month card Euro 38 since April 2019 which is not transferable is only for permanent residents and not for tourists. This card isn't limited to a specific route and can also be used back and forth in a day as often as required, within a single month, though. Hence, it is valid for the public buses on all Canary Islands as well as Tranvias. Kindly note that it's not for the Teide buses. 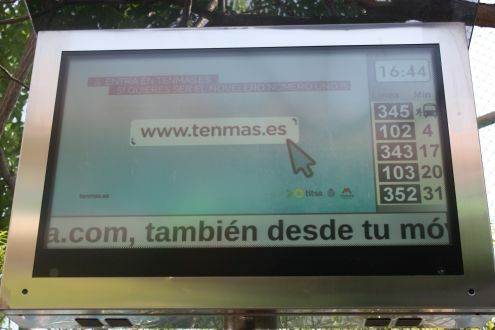 Google movil.titsa.com in your smartphone and inquire about bus numbers and their time tables. By putting the number of a bus stop you even are told in how many minutes a bus will come. Mind many little stop stations have physical timetable billboards attached to posts, lately. By the way, Guagua 345 La Caldera on the screen below is the route bus to Mount Teide that stops in La Paz but, doesn't go all the way any more. You must take the bus 348 now from Puerto de la Cruz to Teide but, not from los Cristianos. In fact, the new bus screens, as portrayed above and below remind airplane arrivals. Some are now overhead by terminals as well as by important bus stops in towns like Santa Cruz, La Orotava, Tacoronte and Puerto de la Cruz La Paz with more to come. I am sure you shall spot some in Tenerife South as well. Indeed, there has been very much progress with Guaguas since 2013 and above all in 2018. The bus lines 101 and 102 (12 stops)and 103 Express used to connect Puerto de la Cruz and Santa Cruz for decades. Important changes namely Titsa Cambio de Rutas have caused a change of route direction for both the 101 as well as the 102 since December 2018 together with 12 other Northern Guagua lines. 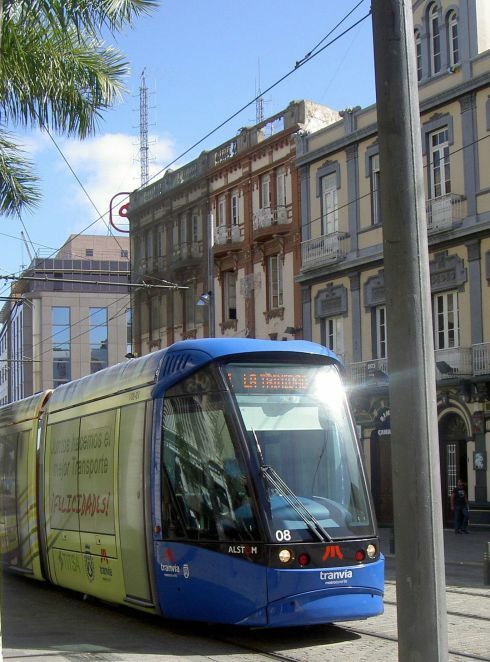 Tranvia Metro operated by Titsa transport in Santa Cruz de Tenerife. See all Tranvia stops from the capital to the North airport Los Rodeos via La Laguna on this Google map here. How old is the Metro Tranvia of Tenerife? The Tranvia between the capital Santa Cruz and San Cristobal de la Laguna had its tenth anniversary in 2017. By the way, it's only a very short distance from La Laguna to the airport by Guaguas which is the local name for the green public buses. They also service directly from Los Rodeos airport to Santa Cruz and vice versa, but traffic jams are possible. By the way, the Tenerife South Reina Sofia Airport bus 343 from Puerto de la Cruz may not stop at the North Airport Los Rodeos any more. Now, it is Titsa 30 that takes you from Puerto de la Cruz to the North airport. Mind, now in 2018, there are options to travel to London with Iberia Express more of which here from both Airports while the Tenerife North route often involves transit in Madrid. All airport lines with time tables? By the way from Costa Adeje and Los Cristianos, Titsa No.40 replaces previous airport buses to Aeropuerto Sur Reina Sofia the South Airport. Electric so called Green Buses in Tenerife? 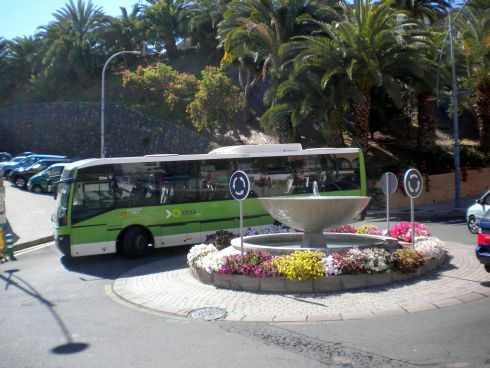 There are no so called environmental friendly electric or semi electric buses on Tenerife Island. However, there were test drives with special white and green buses in the capital as well as in La Orotava, some time ago. They would certainly need to switch to Diesel on the island's steep slopes. I went all the way to the main bus station in Santa Cruz to find out if the novelty buses are in circuit already. 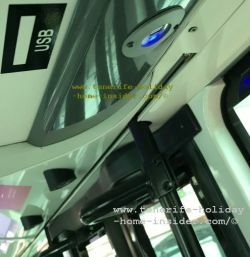 Electric operated wheelchair ramps and blue USB sockets for smartphones have been installed in many buses. You can charge you mobile phone in the front, in the back and by the exit door, as depicted. Simply type three words in English in your Search engine. I mean the name of the Tenerife bus and Tranvia company together with Service FAQ... You should find answers to any of your remaining questons. You will even discover a complaints option there according to Spanish law. Our hot tip: Telephone: (0034 from outside Spain) + 922 531 300 for information on public buses and their departure and arrival times where English is an option. Always try to call in the morning on workdays and don't wait for the last day before you travel. Remember always double check on a bus line, as timetables keep on changing fairly often. The cheap airport hotel Monica Sur in San Isidro (airport bus 450 Costa Adeje, Aeropuerto Sur, San Isidro) However nowadays, I would book most probably this Tenerife beach hotel rather, as El Medano is very closeby. There are some free buses to Mount Teide in Winter on the first day after heavy snow. The new shuttle bus 369 to Punta de Teno costs Euro 1 to get there and again Euro 1 for the return ticket. Mind that you can't use the Tenmas card for trips to the Tenerife National park the Cañadas and to Teide.